Although cooking outdoors is often a great way to prepare food, the chances are that, in a survival situation, you’re not going to have the right types of food or cooking utensils to make it much of a pleasurable experience….or, so you might think! Your skills and knowledge of how to gather food and water using natural means and to prepare it correctly will often give you an even greater sense of achievement and will boost your morale even further which is important, in addition to providing you with the nutrients which will help you to survive. Unless you’re an expert in foods in the wild which can be eaten raw, you need to ensure that you cook all the food which you’ve harvested thoroughly to make sure it’s free from parasites and you should check that there are no visible signs of disease or abnormalities. This goes for plants too, some of which are safe to eat when cooked but highly toxic if eaten raw. This technique comes in handy when you’ve not got a container which can be placed upon or over an open fire. You need to gather some small rocks or stones which won’t shatter or crumble and heat them in the fire for about 2 hours. 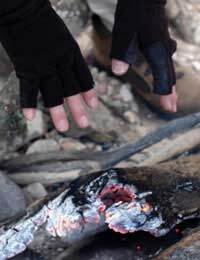 In a survival situation, make sure you have a back up set of rocks in the fire when the others have been removed to help with the continual cooking. Once the rocks are hot enough, you can remove them from the fire and put them into your container of water which will then begin to boil. At that point, you can start adding your food to the container to cook it. You need to ensure that you’ve got more rocks to add if you want the pot (or whatever your container is made from) to keep boiling. You can make a spit out of a sapling and simply skewer a gutted, skinned and cleaned small animal or fish which you can then suspend over the heat turning it regularly. To ensure it’s cooked through, it’s better to do this over coals or some other type of low intensity burning material as opposed to over open flame. This is great if you want to steam your food. Basically, you need to dig a pit or hole in the ground and line the bottom of it with rocks. Then, build a fire on top of the rocks and let that burn for a couple of hours until the rocks beneath are red hot. Then scrape out the remainder of the fire and place some non-poisonous grasses about 7 or 8 inches deep on top of the rocks. You then place the food you’re cooking on top of the grasses. Wrapping the food in large leaves first is often a good idea if you want to seal in the juices from your food. Then place some more grasses and seal the pit with some bark or similar material and some earth. After a couple of hours, just remove the earth, bark and grasses, not forgetting they’ll be hot and your food will taste delicious and it’s a method that also helps to retain the food’s natural juices. Following a similar process to the rock boiling technique, once again heat the rocks in the fire and, once removed, you can use them almost like a frying pan. Other alternative methods include building a rock oven for baking but for a quicker solution to cooking things more slowly, use a rock or slab of wood as a reflector by propping it at about a 45 degree angle from the fire. As it heats up, you can then use it like a grill remembering to turn the food over to ensure it’s evenly cooked. Enjoying a meal when faced with a survival situation is going to be a fantastic morale booster and the gathering of the food and its preparation is all part of that. Not only will it help pass the time of day and keep your mind occupied, it will sustain you and give you energy for the days ahead, should a rescue or escape not be immediate.